Instant Messaging application WhatsApp starts applying two-step verification scheme (two-step verification) on its services. This procedure is optional for added security of user accounts. Verification first, as has been done for this, is through the phone number used for number WhatsApp. The application will send the code via SMS or phone that must be entered by the user, when you enable the service. The second verification in the form of a six-digit pass code that is made by its users. Six-digit number that must be entered each time they register their phone number to serve as the contact WhatsApp again. For example, when users buy a new smartphone but still want to use the SIMcard and the same number. To enable this two-step verification, update to the latest version WhatsApp application, this can be done through Google Play Store for Android or Apple App Store for iOS users. Then, go to the menu Settings > Accounts > Two-step verification > and Enable. After entering the number six digits as a pass code, the user must remember it, or backup it via e-mail. According to the official blog of WhatsApp, as quoted teknokia.com, Wednesday (15/2/2017), e-mail can also be used to disable two-step verification if the user forgot the passcode that is used. No pass code will be required each time you open WhatsApp, WhatsApp will ask however this pass code on a periodic basis within a certain period (seven days), to help the user remember the pass code is used. 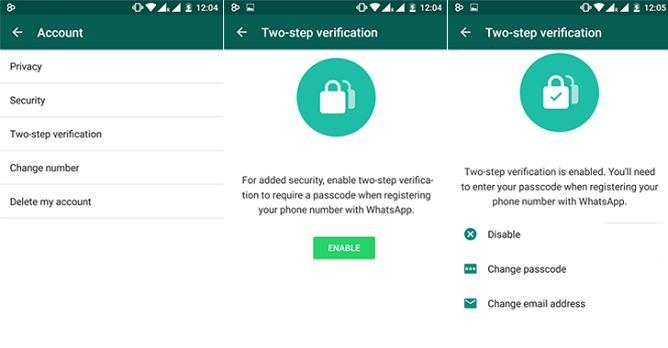 Two-step verification used WhatsApp is different from the schema that is used by Google or Facebook. The two services that make the code with the application and send it by SMS. In the platform, which makes it the WhatsApp users itself and should keep that in mind? Previously, the feature has been released for users WhatsApp beta since November 2016 and then for testing. WhatsApp but is now opening it for about 1.2 billion users. This update is given in stages to the user WhatsApp.